Bandai Namco is bringing its adorable drum-based rhythm game series Taiko no Tatsujin to the West for the first time in over a decade, and in a surprising move, it’s keeping the Japanese title. Rather than something like “Taiko: Drum Master”, as was used previously—a redundant name, since “taiko” just means “drum”—the new games for PS4 and Switch are called Taiko no Tatsujin: Drum Session! and Taiko no Tatsujin: Drum ‘n’ Fun! Taiko no Tatsujin: Drum Session! includes a competitive online mode Ranked Mode, and also features guest characters like Heihachi from Tekken 7, Pac-Man, and Hello Kitty. 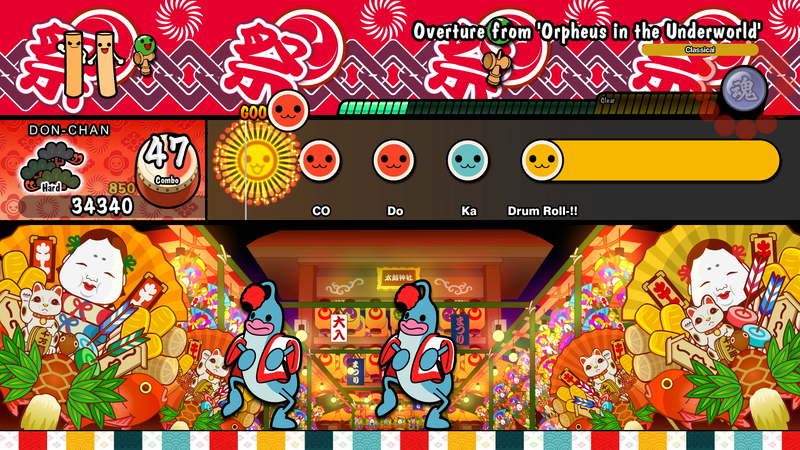 By default, players use the PS4 controller to play, but the Japanese version also had the option of a drum peripheral to better replicate the arcade Taiko experience. Namco Bandai hasn’t said whether this will be released in the West, though. On the other hand, Taiko no Tatsujin: Drum ‘n’ Fun! can be played with either buttons, the Switch’s touchscreen, or with a motion control setup that uses each JoyCon as a drumstick. It also includes a party game mode with 20 mini-games for up to four players, and characters and music from Nintendo games like Super Mario Odyssey, Kirby, and Splatoon 2. Each game boasts over 70 songs to drum along to, though track lists for the Western released haven’t been unveiled yet. Assuming they’re the same as their Japanese counterparts, each game spans a range of popular hits, classical music, anime and game soundtracks, and vocaloid tracks. Furthermore, the Japanese releases had very different lists for each game, with only a handful of songs appearing on both PlayStation 4 and Switch. These two games will be the first Taiko games with a Western release since the 2004 PS2 game Taiko: Drum Master, and the first ever to be officially released in Europe. They’re cute, charming, expertly-crafted rhythm games, so here’s hoping they do well enough to convince Bandai Namco to keep bringing them across.